Buy an SQ, Get Two FREE ME-500 Mixers! The SQ-6 is a next generation digital mixer, powered by Allen & Heath's revolutionary XCVI 96kHz FPGA engine. Created to excel in demanding scenarios such as AV, corporate events, live productions and houses of worship, SQ-6 offers class-leading high-resolution audio fidelity and an ultra-low latency of <0.7ms. 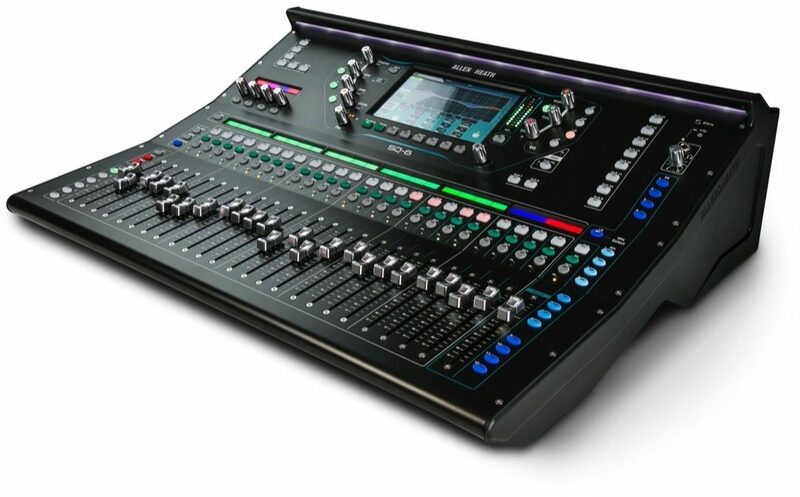 The console features 24 exceptional onboard mic preamps, plus 8 stereo FX engines with dedicated return channels and access to the renowned RackExtra FX library. SQ is a natural choice for in-ear monitor setups, providing 12 stereo mixes (configurable as groups or auxes), whilst Automatic Mic Mixing makes it an excellent choice for conferences, panel talks and more. SQ is a future-proofed, next-generation console, powered by Allen & Heath's 96kHz XCVI FPGA engine. XCVI delivers class-leading high resolution audio quality, ultra-low latency of variable bit depth for ultimate precision and noise performance, mix coherency down to the sample, and the sheer power to handle high channel / mix counts and ample FX / processing. SQ-6 has all the onboard I/O you need for standalone operation. Thanks to its SLink intelligent port, SQ can also be expanded up to a total of 48 mic inputs via a family of 96kHz and 48kHz rack and stage box expanders (e.g. AB168, AR2412, AR84 and DX168), making it a flexible, mix 'n' match solution for owners of other Allen & Heath digital systems. You can also link your SQ directly to another SQ or even a dLive system. SQ is the centrepiece of a growing ecosystem of apps, expanders, audio networking, personal mixers and more, allowing you to connect, adapt and expand to your heart's content. It's compatible with leading audio networking standards too -- add an audio networking card such as Dante or Waves to SQ's I/O port and you're ready to integrate with installed systems, provide a digital FoH / Monitor split and more. SQ's advanced automatic mic mixer (AMM) features make it ideally suited to mixing conferences, panel talks and TV shows. It's fully integrated in the mixer too, with no extra latency, so you don't need to route the audio to an internal DSP rack. Overall: Ease of operation, great sounding, good looks, connects easy With other stuff, super features, All in All Best in class.